Provide comfort for the family of Craig Black with a meaningful gesture of sympathy. Craig Alan Black in his 58th year, passed away in Madison on Wednesday April 3, 2019 after a long brave battle with Cancer. Beloved son of Sharon Black (Herzog). Dear brother of Robert Turner and wife Mary Pat of Madison Wisconsin, Mark Turner and wife Jane of South Elgin Illinois, Mary Kleinhans and husband Jim of Columbus Wisconsin, Steven Black , David Black , Howard Black (Kari Nelson) all of Madison Wisconsin and Heather Schneider and husband Rich of Madison Wisconsin. Craig is further survived by many nieces, nephews, great nieces, great nephews, other relatives and friends. 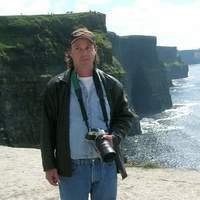 Craig was a kind and gentle person who enjoyed spending time with his family, traveling to foreign countries (especially his trip to Ireland with 3 nieces and his Mom), reading, and studying languages. Craig’s main passion was playing and collecting guitars and fishing with friends and family. Craig always had a positive disposition and a radiant smile that would warm the hearts of everyone around him. He will be greatly missed but not forgotten. The family would like to extend their appreciation and gratitude to Richard Pollak for all his care and dedication to Craig this past year. With respect for Mr. Black’s wishes, cremation has taken place. There will be a celebration of life and lunch held at Capital City Riders MC on April 27th from 1:00pm to 5:00 pm, 1325 Parkside Dr , Madison Wisconsin. Online condolences fosterfuneralhomes.com. To send flowers in memory of Craig A Black, please visit our Heartfelt Sympathies Store. Provide comfort for the family of Craig A Black by sending flowers.